A New Addition to our site: Smart Meter News Updates and a separate area devoted to “Smart Grid Syndrome” testimony submissions. We have coined the phrase “Smart Grid Syndrome”, so that the medical profession will recognize we share the same symptoms and health impact as of the wind turbine syndrome. A different source, but same impact. The source of the constant hum and motor or drum like drone is the Global smart grid network. To give those who do not hear or understand what the “Illegal Pure Tones” are (the NOISE POLLUTION being heard 24/7, 365 days a year), please listen to the EMERGENCY BROADCAST SYSTEM SIGNAL and imagine yourself as a victim who hears a similar tone(s) and the daily impact this would have on you. Pure Tone” means any sound which can be distinctly heard as a single pitch or a set of single pitches. I HAVE HEARD THIS NOISE POLLUTION OVER 8 YEARS AND COUNTING AND CURRENTLY SERVING A LIFE SENTENCE, IMPRISONED BY THIS ASSAULT ON MY BEING OR UNTIL THE APATHY OF THE PUBLIC TURNS INTO EMPATHY AND STAND UP INSTEAD OF STANDING BY. THIS IS EFFECTING EVERYONE; EVEN IF YOU CAN’T HEAR IT. This publication is intended to complement the EPA’s “Levels Document,”* the 1974 report examining levels of environmental noise necessary to protect public health and welfare. It interprets the contents of the Levels Document in less technical terms for people who wish to better understand the concepts presented there, and how the protective levels were identified. In that sense, this publication may serve as an introduction, or a supplement, to the Levels Document. *”Information on Levels of Environmental Noise Requisite to Protect Public Health and Welfare with an Adequate Margin of Safety,” EPA/ONAC 550/9-74-004, March, 1974. Hearing Damage from Environmental Noise. There is no question that exposure to certain levels of noise can damage hearing. However, determining exposure levels that protect hearing with an adequate margin of safety is a complicated matter. This is because hearing is a complex ability that cannot be summarized by a single number in the way an individual’s height or weight can be described. In fact, sizable differences exist between individuals’ hearing abilities. Hearing acuity tends to change progressively with age. Also, environmental noise exposure may vary considerably from moment to moment, so that specification of protective levels should include dynamic considerations. Further, relationships between hearing damage and noise exposure must be inferred, since available scientific information was gathered from groups of people who differed not only in noise exposure, but also in other important ways. Finally, individual and group noise exposures (especially over a working lifetime) are rarely known with precision. In reaching conclusions about hearing loss, then, one must rely to a degree on assumptions, hypotheses, and extrapolations from existing data. Since complete agreement within the scientific community on these matters is lacking, an attempt was made in the Levels Document to consider alternative assumptions and hypotheses to ensure that the methods used to derive protective levels were based on the most defensible practice. As new data become available these levels may change slightly. PLC IS THE ROOT OF THE SMART GRID NOISE POLLUTION!!!!!!! This is why it is ubiquitous; what we all share in common, whether we live in urban or rural areas with different variables. Whether you live or live without cell towers, municipal water and sewer, industries, highways…..we are, ALL, experiencing the same PURE TONE noise pollution. The common denominator…..ARE the power lines!!!!!!! Please read the info at the link below. It will inform you to what you experiencing. No, you are not crazy. 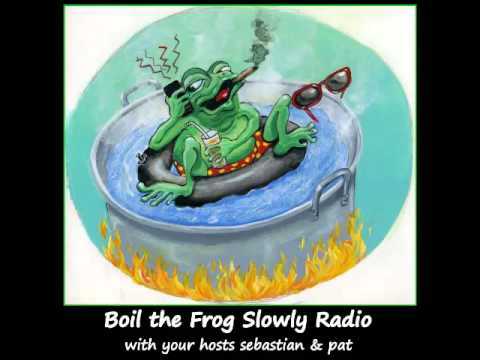 We began this story winter or 2006 in MA, trying to bring attention to serious problem of disruptive and noxious noise due to DSL/wireless transmissions conducted across utility lines. Despite the backing of scientists and researchers, and reams and reams of studies and papers pointing to this phenomenon, we continue to live day after day with this same noise caused by what we thought at the time DSL transmitting on dirty power lines. The noise is obvious all through the town, and in many towns where the ambient background noise levels are quieter than large cities. Since we began this fight three years ago in MA, we have also lodged complaints in New York State, as we have homes in that State. We filed with New York State Public Utilities Commission and Attorney General’s office because of noise we found at our homes outside of Albany and Manchester, NY. The Commission has contacted Verizon, Albany, Windstream Communications, Rochester, National Grid, Albany and RG&E of Rochester, NY. We have been working with the power quality engineer, Dave Shields since September 09. Unfortunately, Unlike National Grid, RG&E have been very cooperative, but when we filed a complaint#001760 with the New York Public Utility Commission Mr. Shields was given orders not to speak to us or answer any more questions. RG&E refused to put in writing or comment on the issues that were revealed in the testing regarding the power quality. The technician who accompanied Mr. Shields, Mark Randolph, heard the noise, both while the power was on in my parents home and after he disconnected the neutral and turned off the main. I asked for them to perform this test so that they would not try to point at the trouble as being inside the home instead of outside and coming in, as it is doing. They tested outside and the results prove there is serious harmonic distortion on the system. I am hearing from people everyday who are becoming aware of the noise and are very troubled by it. Like us, they have investigated to no avail and the noise continues even during power outages, wakes them from deep slumber, and causes other irritations throughout the day. Likewise, they do not know what to do about it. We returned to do a test with RG&E and Windstream. They disconnected their wires to my parents home, as well as a neighbor down the street, (on different transformer and different phone service provider). We already knew what the outcome would be. The noise was still present in both homes. This only proved that the noise is not coming from anything inside the homes. It did not prove that the utilities were not responsible because the transmission on all the lines all around us were still on transmitting. Mr. Shields was not present for we were told he took an early retirement and Mark Randolph was on vacation. So we were unable to speak with them again. Despite the comfort in knowing RG&E have confirmed there is a noise problem, I have yet to receive any opinion or comments regarding the technical results in the form of graphs, waveforms, reports. The corporate office of RG&E called and said they are having a corporate conference to go over all the notes and reports, and will get back to me with feedback. They closed the case! Stonewalled again. The New York Attorney General’s office never responded to our letters regarding this matter. The Public Utilities Commissioner’s office, didn’t argue our conclusions that the DSL/Wi-Fi is the source and the cause of the Radio frequency interference on the power lines, but instead were quite agreeable, saying that no one should have to live with this in their environment. When we looked up our case number#001760 we saw that the case was closed in February by RG&E, without notice to us. This did not make any sense since we were in the middle of coordinating the test for April 22nd! We contacted the Commissioner’s Secretary to inform them of this. They forwarded the copy of our letter to Arthur Kruppenbacher and a few days later I received a hostile email stating that he was closing the case #001760. The same day I received a phone call from the commissioner’s office assuring us that they would continue to investigate and hold the utility accountable, if they are causing the disturbance. We thought they reopened it when they assigned it to another field agent Bob Calhoun, but we were mistaken because they instead believed RG&E when they reported no issues or problems are their end. The State refused to do any RF/microwave investigation. The response from the State and Utilities in NY has been somewhat more receptive, but since the Commission has contacted RG&E to on the complaint; RG&E spokesperson, Arthur Kruppenbacher; has contacted us to state We will not be providing additional analysis of data, doing additional testing, or making contacts with other utilities since the testing we have done to date has not shown any substantiation of additional work. 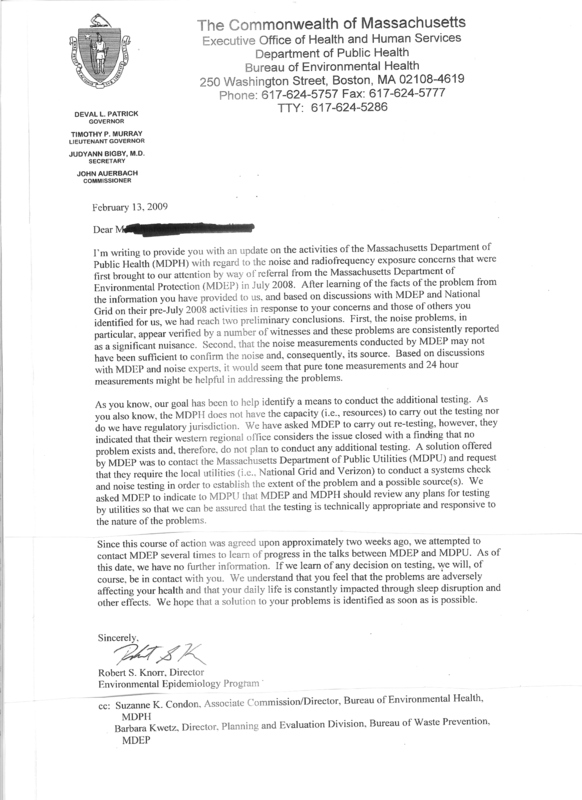 This is the same response we have gotten in MA when they are asked to be more transparent and request that testing be more comprehensive. Our issues in Massachusetts have an additional complication in that some of the noise was being generated by a neighbor’s 25KVA pad mounted transformer. There is thudding and a low, almost infrasound rumbling, from that transformer all day long and all night long, as well. National Grid not only refuses to remove the transformer from the ground and place it on a pole, they have refused to check for possible cable breaks, knowing that the transformer caught fire, several years back. Additionally, they refuse to conduct the proper pure tone/noise testing to help identify and mitigate the problem. They have ignored suggestions from the maker of the transformer itself, and have contaminated testing by covering microphones with plastic wrap and then denying they had any results from one of the overnight meters. This is all true and documented, and sounds like a strange sci-fi novel, but it is sadly true. Our days for the past four years have been filled with searching for and speaking with experts, researching possible solutions, emailing power quality engineers and physicist who are more likely to discuss this problem with some degree of intelligence, and having to hold our tongues with engineers who don’t know the first thing about transmission of noise. All the while, this incessant noise is pounding in our brains, with the torture intensified at night because of the siren pure tones and rumbling thudding resonance when the signals are conducted across the power lines which act as antennae, carrying the noise far and wide. Add to this the fact that lawyers “versed” in environmental concerns have to start at square one, meanwhile charging up to $500 per hour to learn from us about the issue, while they are bombarded by power company reps who tell them we are nuts. The air in our town, and probably yours, too, is thick with harmonics and pure tones, due to wireless technology, DSL/Wi-Fi and microwave towers as well as Smart Grid infrastructure, erected and installed to create a super highway of invisible carcinogenic radio frequencies. Children play on playgrounds and on baseball fields while pure tones provide a nauseating background melody, blending eerily with the sounds of chirping birds and wind through the trees. Bike riders and Appalachian trail hikers wonder what that ringing and buzzing is. Dozens of witnesses have heard the noxious tones and have wanted to shorten their visit to our town, and our homes. They report that their heads fill with pressure and they wake up repeatedly, feeling nauseous, anxious and overheated. As the visitors leave, they offer condolences, some writing letters to the Department of Environmental Protection, begging them to help end this torture for us. But to no avail. The authority and regulatory agencies won’t come out here, or anywhere in Massachusetts to do any effective testing, and then they allow the utilities to drag their feet for years, pretending interest, while all the while putting up road block after road block, so that no regulatory tests ever get done. We have most recently confirmed evidence by a certified audio forensic engineer that we do have a constant audio noise that is pulsing. It is definitely man-made, has microwave characteristics. It is bursting every second with a 1/8 second microburst. The dominant frequency is 217Hz. This frequency has been researched with published studies and considered to be a cause of DNA strand breakage in the brain. This is in our air 24/7 non stop. See the evidence posted on the blog. 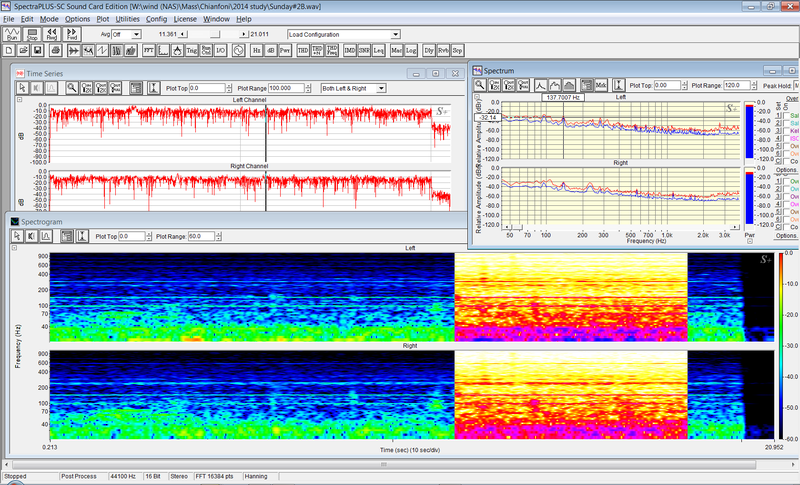 Recently, an FCC engineer in Washington asked to see the noise plot results from our expert. 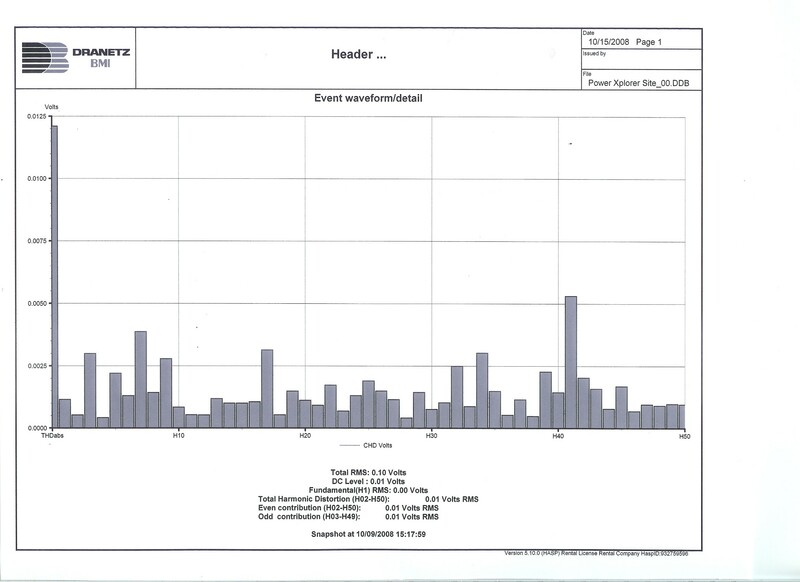 He saw the consistent noise plots in three different recorded environments and said it is a red flag and can’t understand how they all can have the exact fingerprint of noise. Yes! He sees it and has never experience anything like this before because never in the history of mankind have we all been exposed to deadly microwave frequencies. It is new to us all even the experts. The noise is a by-product of the leakage that is radiating in our air everywhere. Our Electric Power Grid is one continuous antenna leaking the noise and illegal emissions(Dirty Electricity into every home. We know the truth and have confirmed it with physical evidence. We are confident that in a matter of time the crack we have made with be cracked wide open and the people culpable for this Mass genocide and believe me, it will be, will be held accountable. Does it mean we will not have our wireless technology available, NO, it means that Utility Companies and all affiliates will have to spend the billions of Blood money they are making while compromising our well-being, to fix the illegal and deadly emissions. If this will take a Federal Class Action suit then so be it. Every morning I wake exhausted and not with joy for the new day and all the wonderful possibilities it has to offer. I pick up the phone and start calling again for help that doesn’t come. It is like “Ground Hogs Day” The same hell just repeats itself over and over and over and this has been the routine for over 3 years now. No wonder the second home owners in our neighborhood rarely come here. Time will never be able to replace the year we have lost on this problem. I fear the stress of what we are involuntarily being subjected to will manifest in illness; that will become more evident in the near future. We are living on reserves with the constitutions inherited from our strong family genes, but how long will that last? How can human beings turn their back at people who are suffering? I have cried on the phone and have cried in frustration and anger at Barbara Kwetz, Bob Knorr, the governor’s office, Christine O’toole at the Department of Public Utilities, Karen Robinson complaint mgr. for DTC and DPU, our town, our Senator Ben Downing, and our Rep “Smitty” Pignatelli. We sat with Pignatelli in his office for an hour and brought evidence and recordings for him to hear. He was an electrician contractor before going into wasting space in government. After our meeting he promised to get back to us, but he never. After our meeting he would not call us back or respond to our emails. He just disappeared, just like all the rest of the cowards who are not doing their jobs. http://www.youtube.com/watch?v=7mLtygxIaFs> 1 23 10 Cheryl Wenning from Verizon Corporate office left us a voice message stating there is nothing they can do to assist us. They are at the mercy of the State; they will do anything the State requires them to do! The State has been playing the same game stating that the Utilities are not cooperating and blame the utilities for the delay. The State has failed to protect us, thereby causing serious, irreversible health risks to me, my family, my animals and our community. This is inexcusable. We urge anyone who has any interest in helping rectify this global issue, to contact your Attorney General’s Office to complain about the impact of DSL/Wi-fi and all microwave wireless technology including “Smart Grid” infrastructure. United we can pressure the “power” companies to install the necessary protections to end the infiltration of dangerous contaminants into our lives. We have the right to a safe and hazard free environment. It has been 7 months to the day since the testing without a report. There is no common sense excuse for repeated delays and incompetence on the part of the State. The utilities are another story; they will get away with what the regulatory agencies allow them to. UPDATE: 11 11 11 The State of Massachusetts sent the final Report via email on 11 01 2011. 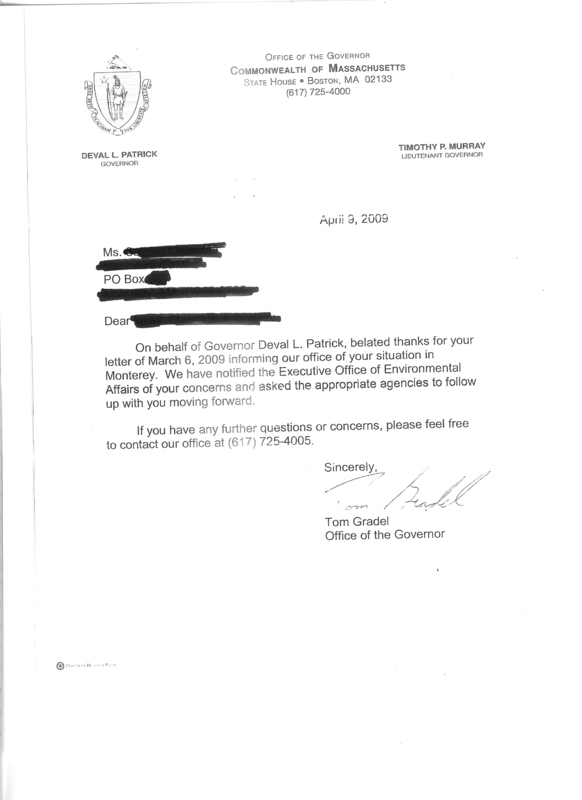 The State closed the investigation. We are reviewing the reports and will be making a statement in response to address the many flaws in the report. It is bogus and without merit; they did not address the issues blatantly ignoring the evidence of microwave RF induced noise and radiation pollution leaking everywhere in our environment thereby allowing the biggest enironmental hazard in the history of our plaent. We will continue to pursue those accountable for the poison they are emitting into our air. An Attorney who is on the side of the truth was quoted as saying “What is happening to us is sinister!” We have requested the public records from all agencies involved in the investigation. We will proceed and do what is necessary to expose the collusion, cover up by the Government/ State/Utilities. In a rural area where transmitter dishes are used to deliver the signal to wireless gateways the resulting power line emissions levels are far higher. The scan on the left tops out at 50d8, the scan on the right tops out at >90d8. Incidences interharmonics are similar in number, frequency position, and shape. This is not going to remain neglected much longer. Victims who hear this torture in their own environments are searching for answers across the country. This is evident by the search terms used in finding our blog as seen below. If you would like to donate to our Legal Fund please contact us. Help Us End Radio Frequency Radiation Pollution! First thing you can do to help is to sign this petition to: “HALT EMR NOISE POLLUTION HARMING HUMANS AND WILDLIFE” AND PASS IT ON…. WE ARE LOOKING FOR CONCERNED INDIVIDUALS TO VOLUNTEER THEIR TIME TO HELP ORGANIZE GRASS ROOTS GROUPS IN THEIR STATES, REGIONS, PROVINCES FOR THE PURPOSE OF RAISING AWARENESS ABOUT DANGEROUS AND HAZARDOUS LEVELS OF RF ELECTROMAGNETIC RADIATION AROUND THE WORLD THAT WE ARE ALL BEING EXPOSED TO, 24 HOURS A DAY, IN OUR, SCHOOLS, CHURCHES, HOSPITALS, WORKPLACE, COMMUNITIES, AND HOMES. We welcome everyone to join, even if they don’t have the time to contribute; at the very least what will be asked of you is the signing of petitions and letters. WE ARE PEACEFUL, LOVING HUMAN BEINGS ENTRUSTING OUR ELECTED OFFICIALS TO PASS EFFECTIVE LEGISLATION TO PROTECT US FROM HARMFUL RADIATION IN OUR ENVIRONMENT. WE ARE ALSO SPEAKING UP FOR PROTECTION AGAINST EXTINCTION OF THE HUMAN RACE AND WILDLIFE SPECIES, WHO DO NOT HAVE A VOICE TO DEFEND THEMSELVES. WITHOUT OUR PRECIOUS BALANCE WITH WHICH WE ARE LINKED TOGETHER, WE WILL PERISH. TO OVERCOME THIS RISK we will educate, write letterS, petition, form peacefully in protest, dedicatING our time and energy until this goal is met. APPROVAL. WE HAVE A RIGHT AND A DUTY TO DEFEND OUR LIVES AS HUMANE BEINGS OF THIS BEAUTIFUL PLANET. WE MUST STAND TOGETHER AND DEMAND OVERSIGHT, ENFORCEMENT, AND LAWS TO KEEP US SAFE AND SEND A CLEAR MESSAGE TO CORPORATE DICTATORS, SPECIAL INTERESTS GROUPS, IGNORANT OR CORRUPT POLITICIANS, AND ANYONE WHO ENDORSES OR ENABLES THIS POLLUTION. THIS IS OUR ONLY HOPE. YOU CAN HELP TO PRESERVE A HEALTHY LEGACY FOR OUR CHILDREN AND TO AVOID ONE OF ILLNESS AND STRUGGLE FOR THEM TO BEAR. NOT TO ACT CREATES A DOMINO EFFECT FOR US ALL WITH NO SAFETY FROM RADIATION FOR ANYONE OR ANYTHING ON THIS PLANET. YOU CAN HELP DISSEMINATE VITAL INFORMATION, EDUCATING OTHERS SO WE CAN COME TOGETHER AS ONE STRONG VOICE TO STOP THIS CORRUPT NEGLIGENCE. WE WILL ALL BRING OUR VOICES TO WASHINGTON BEFORE IT IS TOO LATE. WE WILL SOON BE TRAVELING TO A TOWN OR CITY NEAR YOU AND WILL GATHER SUPPORT BY WAY OF PETITIONS AND PROTEST GROUPS. Don’t forget to post your story on the blog if you are hearing and or feeling the impact this Microwave pollution. If you would like to make a donation to our legal fund follow the link below. If you would like to donate to our Legal Fund, go to the link below. We are still waiting for the noise to be turned off! Dear Fellow RF-EMF Victims (we are all victims whether aware of the effects or not), It is time for the “Humane Beings”, while still able, while still capable, of thinking independently; able to recognize the truth and discard the lies being fed by our corporate driven government who we have entrusted to protect us. We will stand as one, indivisible and united for justice for all living things and for the right to live safe and free from RF-EMF Pollution. We need people to get involved in one of the most serious and relevant issues of our lifetime. My family and I have been fighting every local, state and government authority for over 2 years and have witnessed repeated abuse of our civil and human rights, while trying to seek help and assistance in mitigating serious health threatening exposure to RF-EMF in our community. The same thing we have come to find out is also happening to others in their communities. It is time to choose sides and fight against the corporate take over of our Government and fight for our constitution and the preservation of human life. Because of the nature of the beast that has invaded our lives, our homes, our bodies and has threatened our very existence; we must do what is prudent by joining forces and having our voice ring so loud that we will not and can not be denied. The force of good must triumph over the forces of corporate greed and manipulation. Individuals who are not suffering or experiencing discomfort or not aware of the direct effect it is having on their body, are less apt to step up and get involved. I have lost much faith in my neighbors and even some of my friends and feel at times alienated because they don’t take this issue seriously when it is brought to their attention. The other factor is that the illnesses that people are enduring are not being appropriately related to causative factors such as dirty electricity and RF radiation. Drs are treating only the symptoms and not seeking preventive measures. There are many things I would much rather be doing right now. I never thought in my wildest dreams that this is what I would be doing approaching my retirement years. None of those dreams will ever be realized or enjoyed co existing with this insidious RF electromagnetic serial killer. Under English law, misconduct (or misfeasance) in public office is an offence at common law. The offence carries a maximum sentence of life imprisonment. It is confined to those who are public office holders, and is committed when the office holder acts (or neglects to act) in a way that constitutes a breach of the duties of that office. A public officer acting as such. Willfully neglects to perform his duty and/or willfully misconducts himself. To such a degree as to amount to an abuse of the public’s trust in the office holder. Without reasonable excuse or justification. “Misconduct in public office” is often but inaccurately rendered as “misconduct in A public office”, which would mean something different. In a $25,000-a-copy official Handbook EPRI advises the electric utilities to do remediation of their systems that would prevent electrical pollution, but the actual advice given by one of the authors, who addressed a gathering of national utility representatives shortly after helping write the Handbook, was “Stall as long as possible.Prepare for litigation.” (As recorded in a PowerPoint presentation.) This paragraph sums up the dysfunctional and criminal minded behavior our Government and Industry is poisoned with. Gov’t employees enforcing this mentality are guilty of crimes toward humanity. Until every living thing is living in harmony with our environment and our very existence is not threatened; my walks on the beach hunting for sea glass, enjoying the sun setting and all the things I have worked so hard to enjoy will have to wait until the radiation in our environment is mitigated. It is to choose sides for we are out of time if we don’t act now. IT IS TIME TO STOP THESE INJUSTICES AND TAKE BACK WHAT HAS UNLAWFULLY BEEN TAKEN FROM US. They shall be fined not more than $10,000 or imprisoned not more than ten years, or both; and if death results, they shall be subject to imprisonment for any term of years or for life. If you would like to donate to our Legal Fund you can contact us. *PLEASE TAKE THE TIME TO VIEW THE SMART METER VIDEOS BELOW: CLICK ON OLDER COMMENTS FOR MORE. THE EXPERTS SPEAK THE REAL TRUTH. Please sign and pass on to friends and family. This is a Global initiative that must be stopped! 1. I hear the ongoing noise pollution 24/7 causing deleterious effects.